OK, I'm gonna stick my neck out and start this thread for all the questions and info on ny guitars made under the Deviser umbrella. Yeah that is a beauty! Yah, only the Classic Series (talking about MIJ) has the accurate headstock shape. The rest are their "own" headstock design which can be a bit too fancy. +1, and it's too bad. An ugly headstock like that disqualifies it for me. Question: has anyone ever compared a Momose side by side with a Bacchus? Would it just be that Momose has the more in-demand woods? From what I read about Bacchus, it doesn't seem they're cutting corners in terms of build quality. Does that sticker say "liquor finished"? didn't notice the back.contoured.I expected them double bound which was a nice suprise. Slap..you realize they have roller Nashville bridges, right? I do not claim to have seen that many Les Pauls but the craftsmanship on my Bacchus nut has to be the best I've ever seen. However, the colour is not the opague off-white that you would expect from a bone nut. Is it a bone nut or a moulded nylon nut? Nice deal, even at the BIN for a display model with a small body dent. It went for 40k only! Gammy, you were obviously ripped off paying 25% above the going rate. There has been a big typhoon here this weekend so I guess bidding is thin. 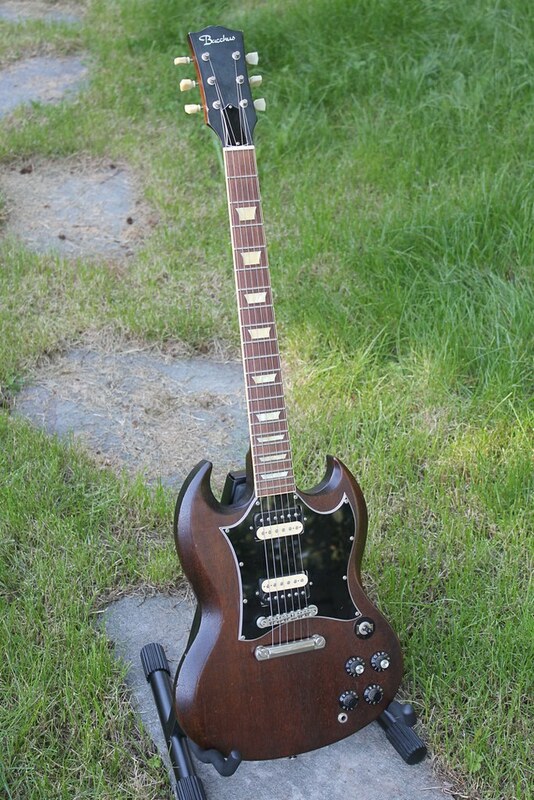 Nice 68 Bacchus SG here for 28k BIN. Bad pictures, but it looks to be a MIJ like JamesT's SG. I've seen a few of these Classic Series that don't seem to be reselling well...Got a theory? In general the market here is probably pretty bad for upper end guitars, in particular the high-end Tokais and Navigators. I think for Bacchus there is not much information out there in guitar magazines here and and name recognition is still a bit limited in general. As well, they compete with lots of other LPs here from Tokai/Edwards in a similar price range. The Classics I have seen in person have been really impressive. I think if they had made them all 1-pc backs they would be selling much better though. I am toying with the idea of selling my LP custom, only because I got an old Greco custom SG with ebony board and can't really justify having both. I got a good deal barely second hand but am not sure if I can even get what I paid these days.